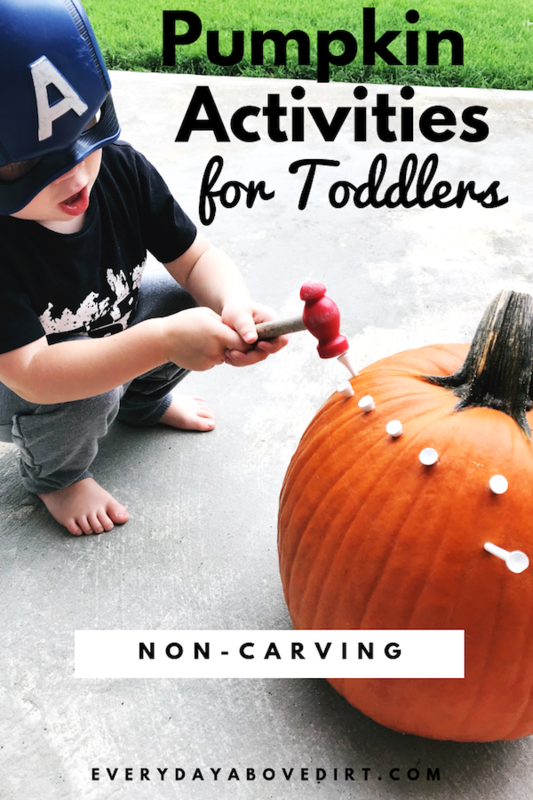 I have found that pumpkin activities for toddlers are few and far between. 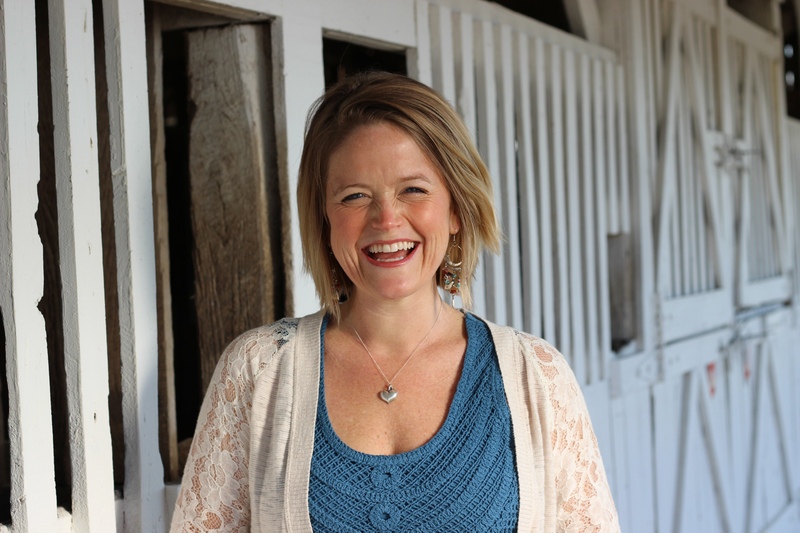 It’s such an awesome time of year and I believe that our toddlers need in on the goodness. Most would agree that Fall is the best time of year. Hoodie weather begins, pumpkin spice everything is everywhere and pumpkins are in full effect signaling a green (or orange) light for the holiday season to begin. This season I’ve taken it on as my personal vendete to right this wrong of the lack of non carving pumpkin activities for toddlers. This injustice (I’m a bit dramatic) has led me to some great ideas for our curious little ones. They are toddler tested and toddler approved so there’s that. Plus, they are pretty cheap and easy (thankfully we’re describing pumpkins here). I’m going to lay the activities out in the order I did them because it made the most sense to me sequentially. But you can pick and choose what you do but I do recommend them all for optimal toddler enjoyment. I found that my son loved some more than others so I’m glad I let him try them all. Now I know what activities to do more of. Full disclosure I’ll be providing affiliate links(at no extra cost to you) to all the materials that I used. Some I ordered from Amazon and some I found at the Dollar Store or just had lying around the house. You can get creative with the materials you have a home. I pumped Foster up by telling him we were going to be doing some activities with pumpkins and I needed his help. Toddlers always want to help, which is the sweetest. So, he was automatically in. 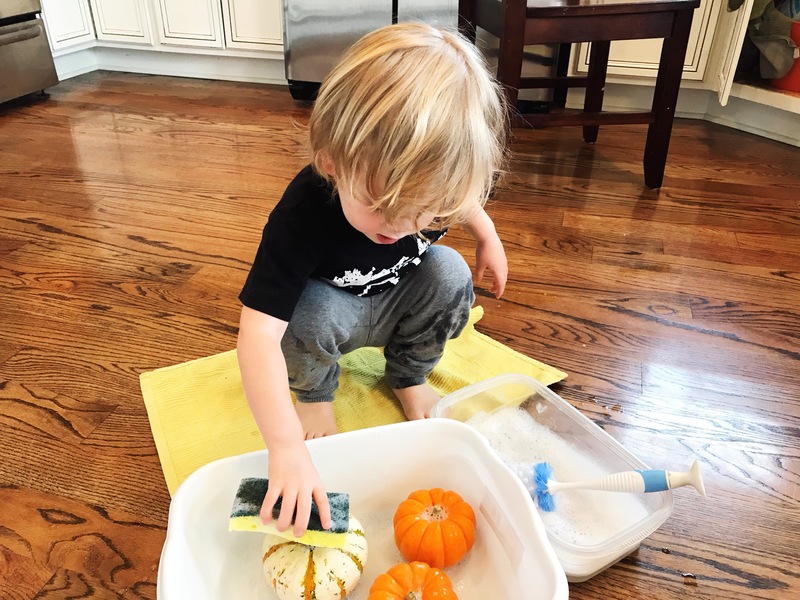 Then I presented him with our materials and showed him how to wash the pumpkins. I told him he could pick which tool he used, the sponge or the brush. On this day he liked the sponge the most. This helps them learn personal responsibility. These are his pumpkins and I told him it was his job to clean them. Just like when we give him a bath. After he was finished cleaning we inspected each one and dried them off to make sure they were ready for the next activities. 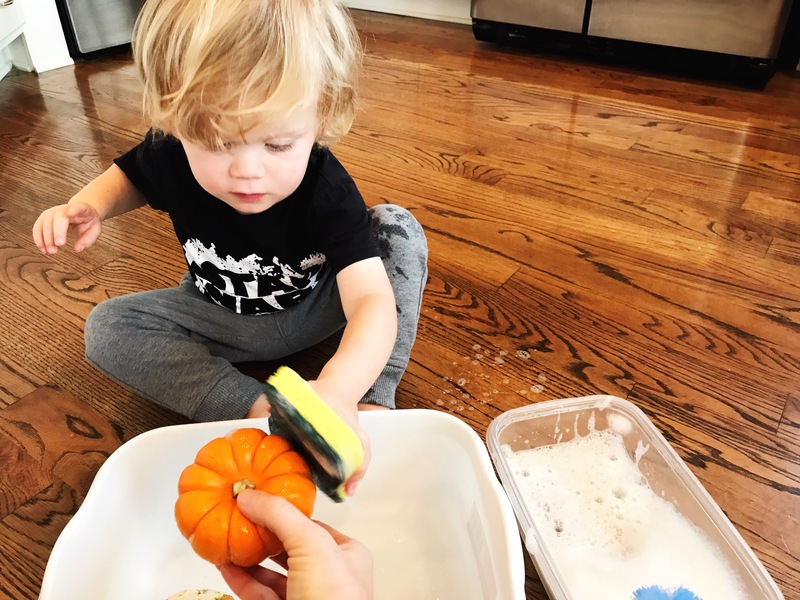 Some modifications were made during this activity because he had a hard time holding the pumpkin while cleaning it. I offered to hold it for him and he wanted me to, so I did. This is where you just decide what’s best for your child. They may want your help but sometimes they don’t and they’ll definitely let you know (if you know what I mean). He pulled out his super hero mask when it came time for the stickers. Game. on! My son loved the stickers and did way better than I expected (I also loved them). These foam stickers came in a pack of with different facial expressions. I chose the most basic one for him to do. He helped peel the back off the stickers. Then we talked about what part of the face he had in his hand and where it should go on his pumpkin. From there he put the sticker where he thought it should go and I was impressed! This was a great activity to work on fine motor skills and hand, eye coordination. I may have done one as well. There are a ton of sticker options in the pack so we’ll be doing a lot more of this one. Or I may end up taking it to some friends to share the love. We’ll see how generous I’m feeling. 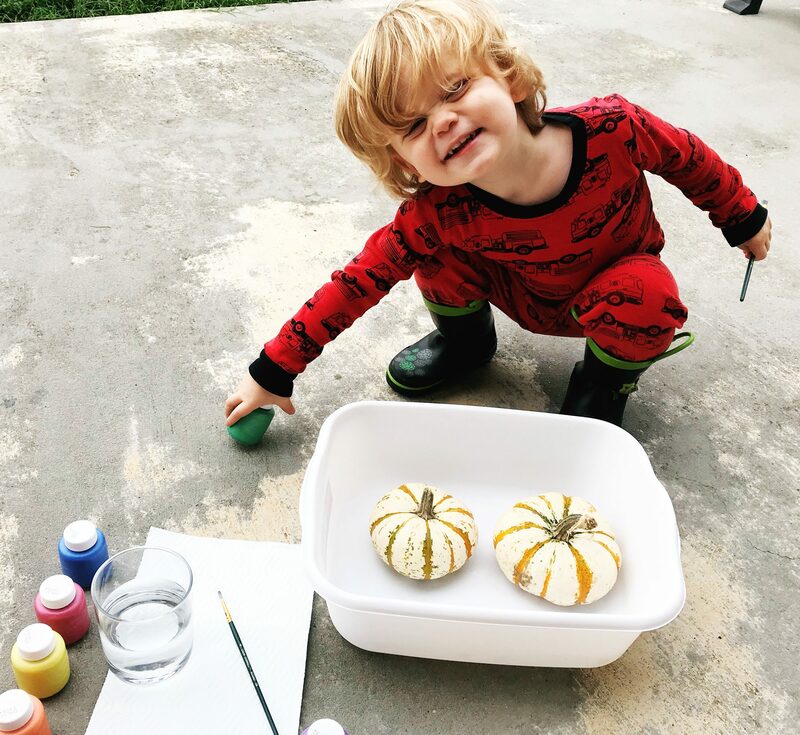 This was hands down his favorite pumpkin activity! I knew it would be because he’s a huge fan of hammering and fixing things. 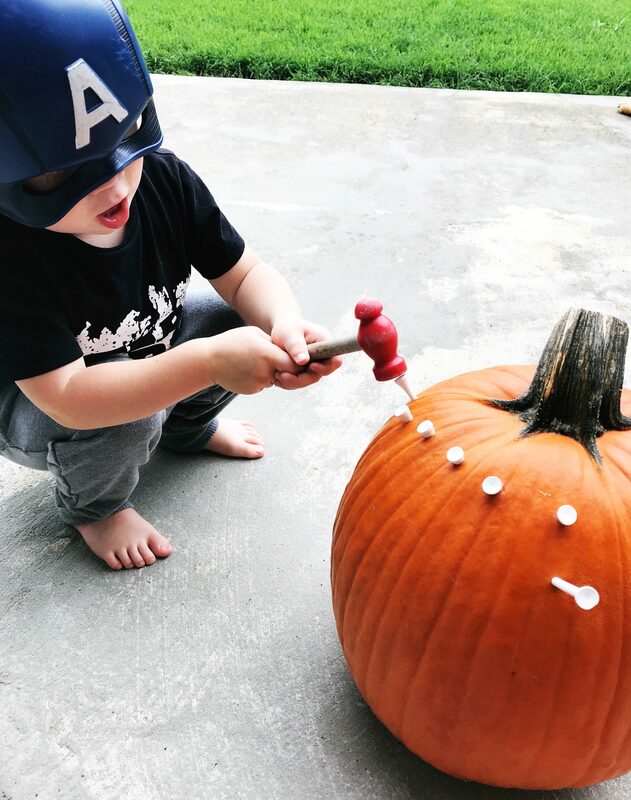 With this activity he could actually hammer “nails” and see them disappear into the pumpkin. It was very satisfying for him to say the least. I would get him started by pushing the golf tee into the pumpkin and then he took it from there. 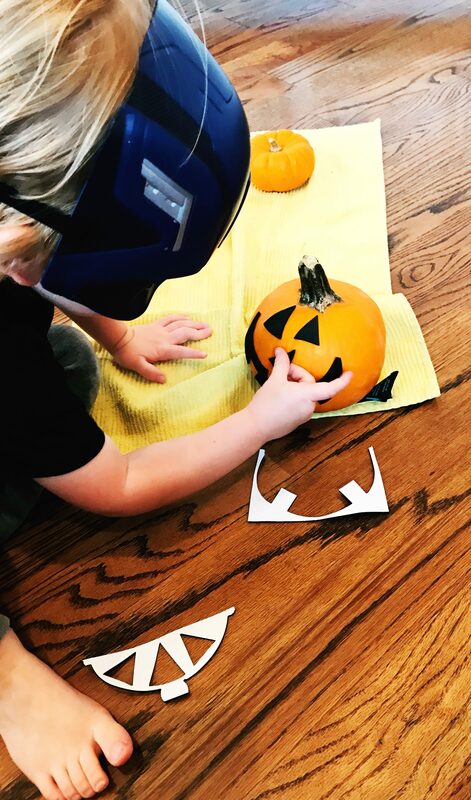 At one point he had one hand on the pumpkin bracing it and the other hammering and I was so nervous he was going to hit his hand but he didn’t (praise Jesus). This activity is awesome for hand eye coordination and building hand strength. Plus you could tell he felt like one bad dude so it was a confidence booster. I love that little smile so much!!! Okay, painting pumpkins. I did a lot of prep work for this one as far as telling my son what was expected. I’m pretty Type A so messes aren’t my favorite but I’ve learned to embrace them on most day. But still, I want to prep him on expectations as much as I can so paint doesn’t end up everywhere. 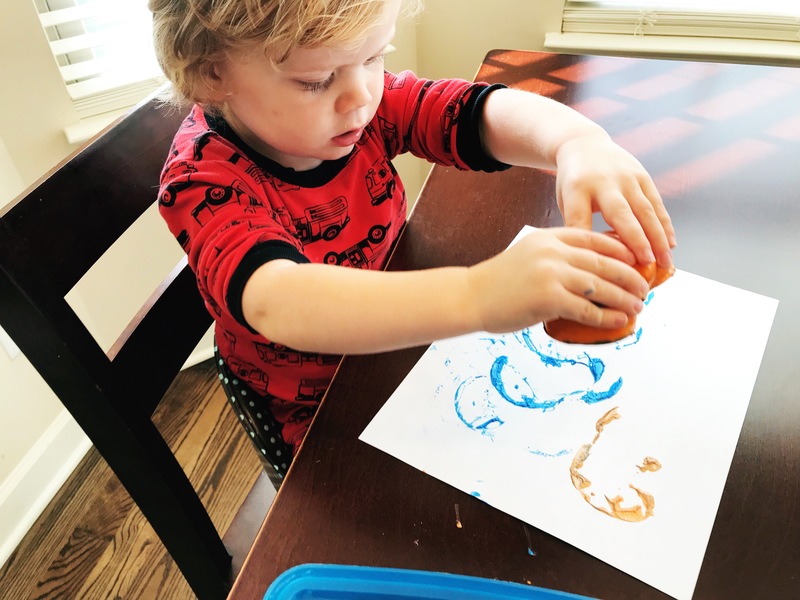 For this activity I ordered this Crayola Washable Metallic Paint. It’s the first time I’ve bought paint that wasn’t from the dollar store and some things are just worth the money (this is one of them)! They were such vibrant colors and SO easy to clean up (important)! Onto the activity…I layed out all the colors. Then we talked about the color names (teachable moments ya’ll). 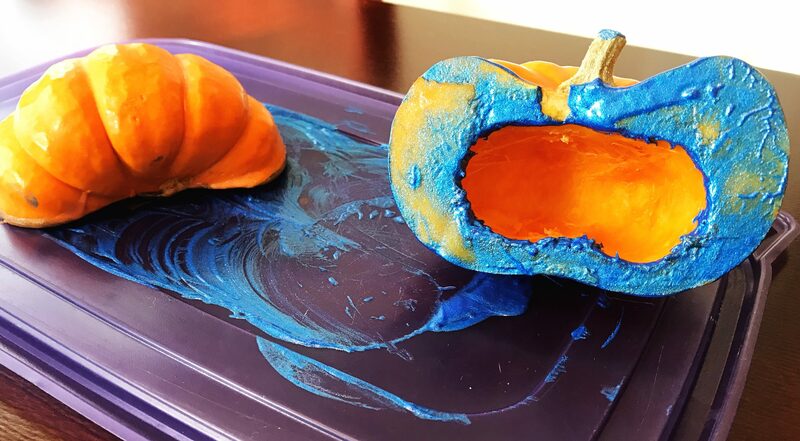 Then I used one of the brushes to show him how to dip it into the paint and how to use the brush on the pumpkin. Lastly, I told him when you are finished with one color we need to wash your brush before you put it into another color. This way the paints will last longer and stay pretty! After that he was off to painting his pumpkin and once again. It went so well. He listened to all instructions and was so proud of his finished product. He decided he wanted to give it to daddy as a gift so he could take it to work (be still my heart). See what I mean about the colors! I decided that people stencil with apples so why can’t we do it with pumpkins?! Well, turns out…we can! Before starting this activity I cut the pumpkins in half and took all the seeds out. I showed my son and told him that this is how they grow. By planting these seeds in the ground. They surprisingly have a lot of seeds! Once again I walked my son through what we were going to do and the importance of keeping paint on the paper! I was not in the mood to wash pain off the walls that day (or any day). I poured a half-dollar sized blob of pain onto a rubbermaid lid. Then I told him the rub the pumpkin around in the paint. 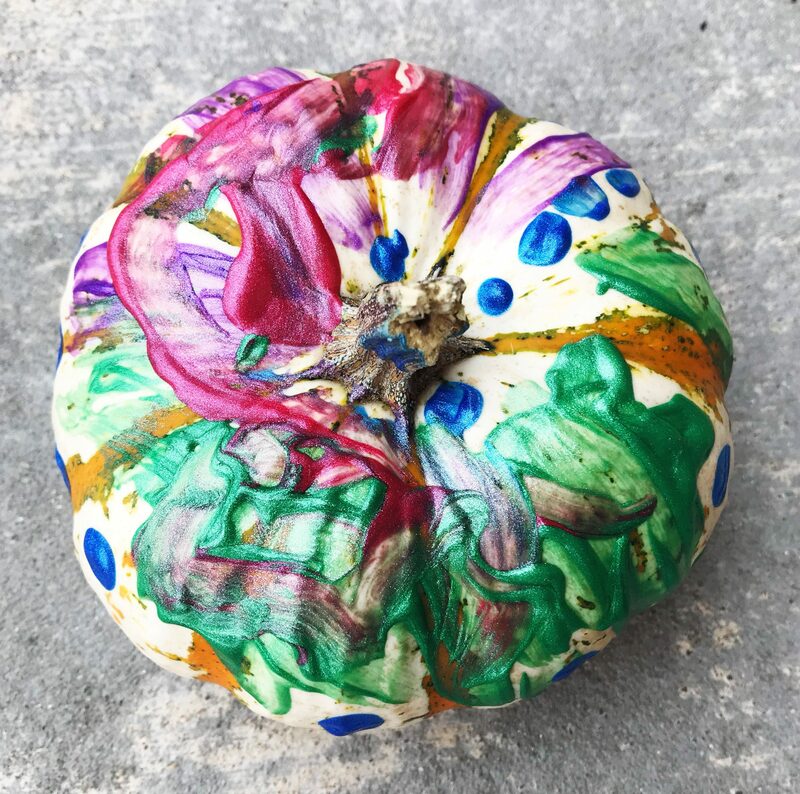 I looked to make sure the pumpkin was mostly covered in paint. Then I told him to press it down on his page. He was pretty impressed to see that we can paint without brushes! Mind. blown! Once again, love those colors! 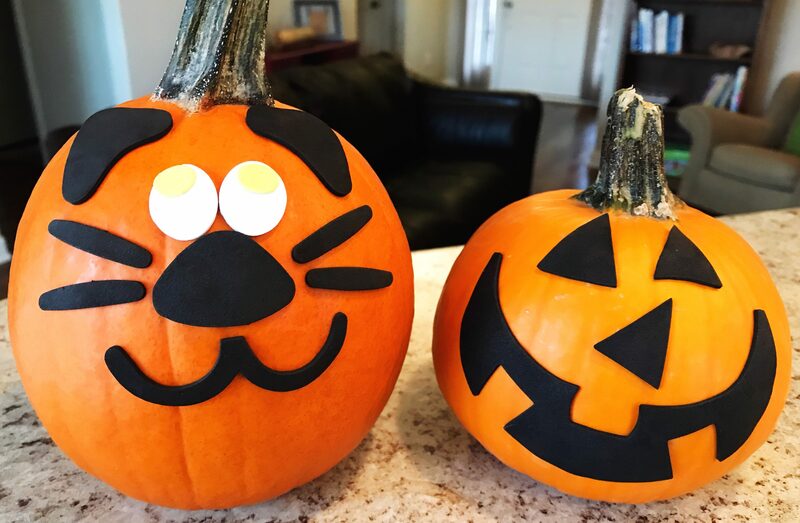 I was very happy with the outcome of our pumpkin activities for toddlers. It’s so fun to do art projects with him that we can then display around the house and talk about days to come. Things like this are also good to do because your kids will surprise you. Whether it be what they like more, how well they listen or what they need more direction with. It helps us to get to know these little people even better, to understand what excites them and what does not. 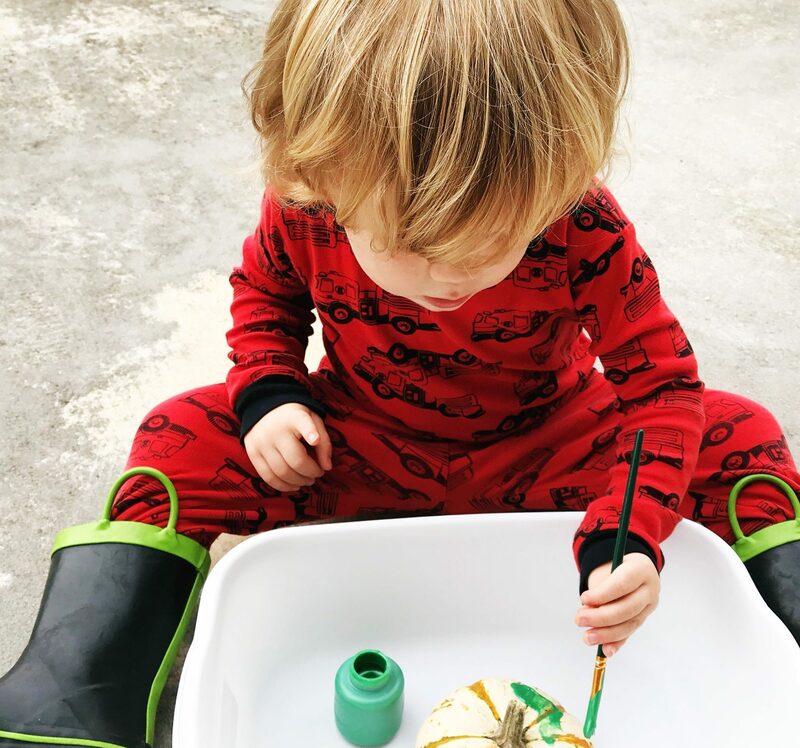 I hope you find some fun things that you can do with your toddler this amazing Fall season!